Be equipped, empowered and encouraged for godly influence in every season and circumstance as Doug Stringer and other leaders share God’s truth through practical teaching and powerful stories of good news instead of only bad news. For more information on Doug Stringer or how Somebody Cares America/International is a tangible expression of Christ’s love to a hurting world, visit SombodyCares.org. While many today pursue exalted and high places, Jesus, The Exalted One, left His highest place to pursue us. Why? Why would He endure a life that would lead Him to the cross? Hebrews 12:2-3 says it beautifully and so clearly: He was willing to give Himself for us, to suffer shame and brutality and to endure the cross, for the joy set before Him. What was His joy beyond the cross? His joy was us and all those who through Him are reconciled to God, our Father and Creator of heaven and earth! In Jesus’ own words, “No greater love has no man than this, than to lay down one’s life for his friends” (John 15:13) Yes, from the manger to the cross, Jesus was born to die, that we may live. In this new episode Doug invites guest, Mike Rosas, to share from his new book, Leading The Revolutionary Generation. What are Millennials thinking? We have heard this question asked in many different forms and fashions. The stark difference between Millennials and previous generations is so blatant, questions echo across the world as past generations try to understand this phenomenon. After over a decade of working with Millennials, Mike has compiled Biblical principles and valuable experiences that can help the previous generations better connect and lead the next generation into their destiny. Yes, I may have had some challenging and difficult times growing up. Yes, society may try to tell us that we can't help who we are because we've come from a dysfunctional family or difficult circumstances. Yes, there may have been sour grapes along the way. But the decisions I make now cannot be excused by the past. As a new creature in Christ, I'm not bound by the actions of others. Regardless of past relationships or circumstances, we are all responsible for our own actions. The Father's love is filled with affirmation, acceptance, approval, guidance, direction, empowerment, encouragement and inheritance. As you listen to this episode, right where you are, know that our Father in heaven has lavished his love on you! "Behold what manner of love the Father has bestowed on us, that we should be called children of God!" (1 John 3:1a). Allow God's love in so you can walk in His love towards others! We are the tangible expression of the Father's love here on the earth! Many are experiencing the shaking in preparation for the harvest. There is a battle for the heart of the church and the soul of a generation. Doug shares a message at a City-wide Communion Service on February 2, 2019. Psalm 51 says, "Restore to me the joy of Your salvation, and uphold me with a willing spirit." We face a time in our nation where we need a restoration of the JOY of God's salvation. The work of the Cross is our common ground. At the cross we are one race, one people! In part 2 of the series "Cultivate a Life of Doing Good", Jodie Chiricosta pulls from a wealth of experience to bring a challenge to our hearts today, The Hebrews Challenge!! People today find themselves in an all encompassing rut of negativity. Our prayer is that we, the Church, truly be a tangible expression of Christ to a hurting world! 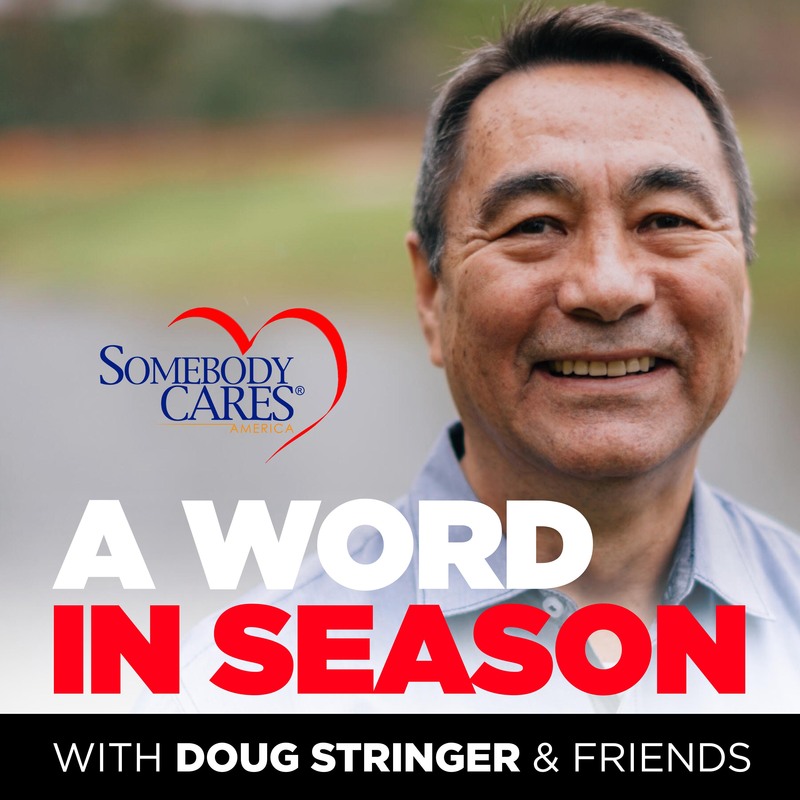 In this 2-part series Doug invites Jodie Chiricosta, Vice President of Somebody Cares America/International, to share valuable insights on how to Cultivate a Life of Doing Good. We see Godly principles from the technique of turning broken things into priceless artwork. There is great value in our brokenness when we put it in the hands of our great God! We must keep our vision of Hope, trusting that we are going through the circumstance for a greater purpose. Unexpected detours, we’ve all experienced them. Join Doug as he shares wisdom on how to recognize these unexpected detours as Divine interruptions that lead us to God's greater purposes and allow us to experience His promises. In a world of bad news, how can we be bearers of Good News? We get back to the basics of our faith so we are anchored on the Rock of our Salvation. Doug Stringer shares some non-negotiables that allow us to be dispensers of God’s grace to those around us every day. Doug Stringer shares truth from personal experience that right choices, regardless of circumstances, bring us to our Divine destination. Our desire to win must be greater than our moments of challenges so we can be a help to others. To serve our generation we must leave an imprint of the characteristics of the Kingdom of God. God did not call us to just start the race, but to finish it and finish well! Doug Stringer invites you to listen to A Word In Season. Each episode will be a time to encourage, equip, and empower you to be a Godly influence in every season and circumstance of life. You'll hear practical insights from God's Word, powerful stories of how God is working in the world today, the good news instead of only bad news; and how you can live beyond the moment to be a part of something bigger than yourself as you journey with the Lord!